I keep trying new challah recipes. 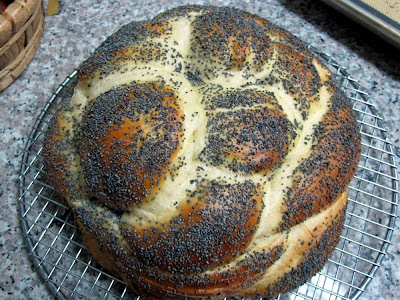 It's such a common bread type that most of my cookbooks seem to have a version of the recipe. So slowly but surely I'm making my way through the recipes. This one by Beatrice Ojakangas is a great one! 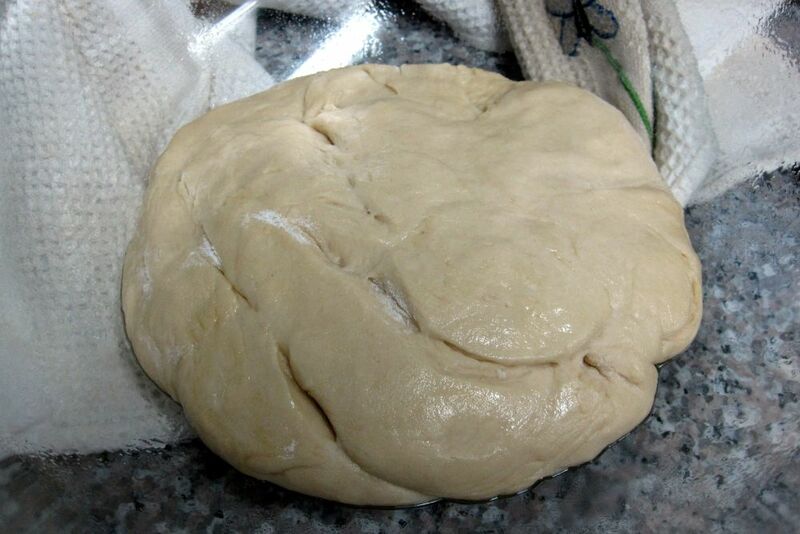 The dough feels awesome as you knead it. That's the moment I can tell the bread is going to be good. There's just something special about working with a dough that's soft and supple and shiny and perfect! For this Shabbat meal, I decided to braid it in the four-strand round method because I love that look. But feel free to braid it however you prefer. 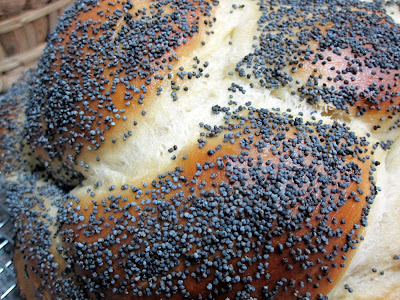 The making of this bread marks an important milestone for me. It is the first bread I've made in my new kitchen! And I really do mean IN my new kitchen. You see, I moved in October. My last kitchen, which I had occupied for the last 5 years, was so small I was forced to knead dough on the dining room table in the next room. There simply wasn't a surface large enough for me to stay in the kitchen. Now, in my new kitchen, I have so much space I can spread out, leave the flour bin beside my work station, not immediately wash my mixing bowl to get it out of the way, keep the prepared baking sheet ready to go right next to where I'm working so I don't have to lift and transfer the braided loaf very far in my hands, and other thrilling usually-taken-for-granted aspects of spacious living. It's all too good to be true! Somebody pinch me! 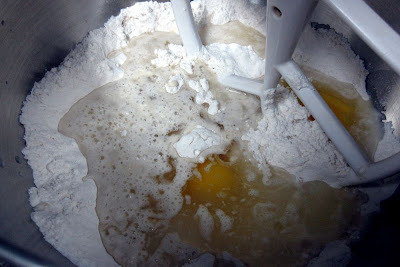 In a large mixing bowl, combine 3 cups of the flour, the sugar, salt, and yeast. Stir to blend. Then make a well in the center and pour in the water, oil, and 2 eggs. 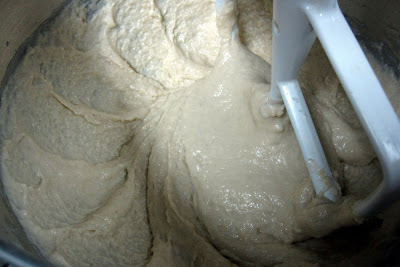 Beat until the dough is smooth and elastic, about 5 minutes. Cover the bowl with a towel and let the dough rest for 15 minutes. 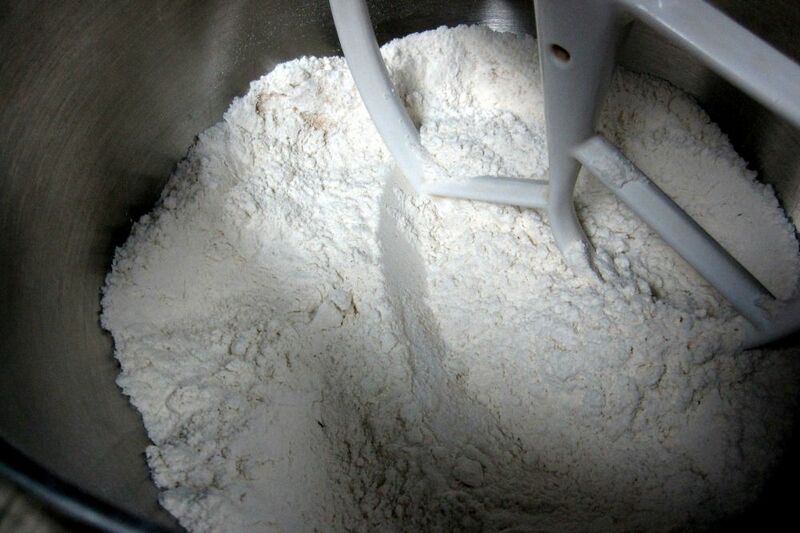 Beat in the remaining flour (1/2 to 1 more cup flour). The dough will be stiff. If the dough is still really sticky to work with, add a little flour, only a tablespoon at a time. Always err on the side of less flour because you may be able to knead the dough and you don't want to add too much flour or your bread will be more like a brick! Turn the dough out onto a floured board and knead until smooth and satiny, about 10 minutes. If you're using an electric mixer with a dough hook, only knead for about 5 minutes (the dough hook is much more efficient than by hand so it requires less time for kneading and you don't want to overknead). Shape the dough into a ball and place in a large bowl that you sprayed with Pam, then turn the dough ball over so both sides are greased. Cover the bowl with a towel and let rise for about a 1/2 hour or until doubled in size. Prepare your baking sheet by lining it with parchment paper or a silicone baking mat. Divide the dough into 3 chunks. Shape each chunk into a long rope about 1 inch in diameter. Braid the three strands together and pinch the ends to seal them. 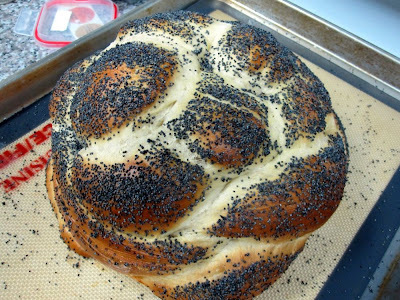 You can transfer the loaf to the baking sheet as a long braid or you can place it on the sheet in a ring shape. You can also use any of several other braiding techniques. Cover the baking sheet with a towel and place in a warm place for 20 to 30 minutes or until puffy. Preheat the oven to 350 degrees F. Create an egg wash out of the egg yolk combined with one teaspoon of water. 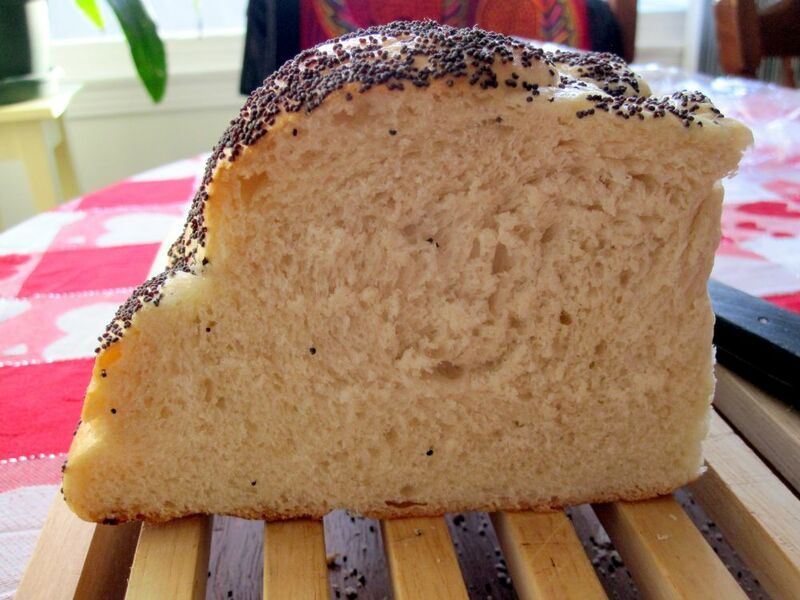 Brush the egg was over the loaf and immediately sprinkle with the poppy seeds (the egg wash dries pretty quickly so hurry and add your poppy seeds or they won't stick!). Bake for 25 to 30 minutes or until golden. If the loaf looks like it's getting dark but it's not cooked through in the middle, place a foil tent over the loaf in the oven for the remaining baking time. 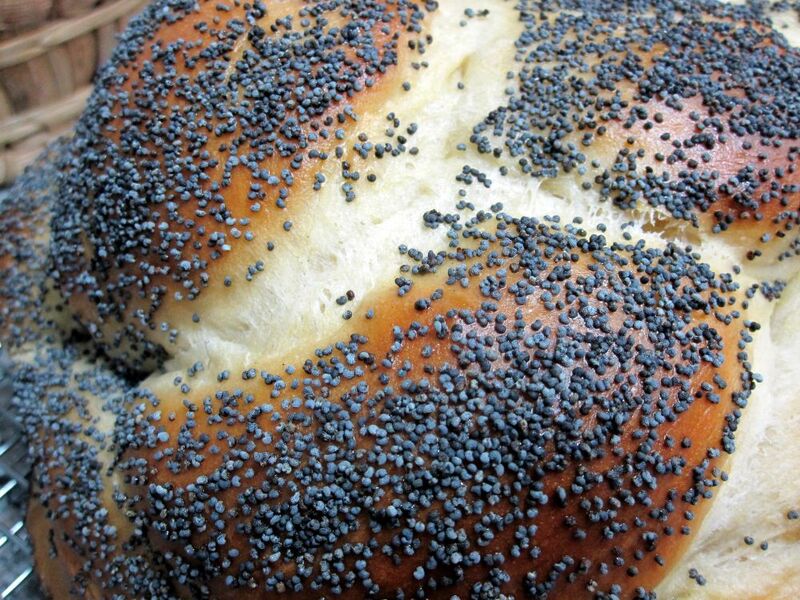 Remove from the oven and cool on a rack. Reading about your baking adventures is fun, but as a photographer what I really enjoy and appreciate are the quality photos you create of each item along with the work-in-progress shots. Good stuff!